The Reserve Bank says it will make some slight easing of the LVR restrictions from January 1. 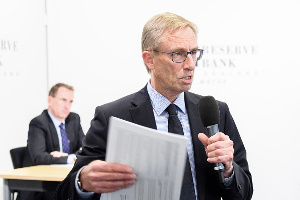 New Zealand’s financial system remains sound and risks to the system have reduced over the past six months, Reserve Bank Governor Grant Spencer said today when releasing the Bank’s November Financial Stability Report. “Momentum in the global economy has continued to build over the past six months, reducing near-term risks to financial stability. However, the New Zealand financial system remains exposed to international risks related to elevated asset prices and high levels of debt in a number of countries. “Domestically, LVR policies have been in place since 2013 to address financial stability risks arising from rapid house price inflation and increasing household debt. These policies have helped improve banking system resilience by substantially reducing the share of high-LVR loans. Over the past six months, pressures in the housing market have continued to moderate due to the tightening of LVR restrictions in October 2016, a more general firming of bank lending standards and an increase in mortgage interest rates in early 2017. “Housing market policies announced by the Government are also expected to have a dampening effect on the housing market. No more than 15% (currently 10%) of each bank’s new mortgage lending to owner occupiers can be at LVRs of more than 80%. No more than 5% of each bank’s new mortgage lending to residential property investors can be at LVRs of more than 65% (currently 60%). “The Bank will monitor the impact of these changes and will only make further LVR adjustments if financial stability risks remain contained. A cautious approach will reduce the risk of resurgence in the housing market or deterioration in lending standards. Deputy Governor Geoff Bascand said “Looking at the financial system more broadly, the banking system maintains adequate buffers over minimum capital requirements and appears to be performing its financial intermediation role efficiently. The recovery in dairy commodity prices since mid-2016 has supported farm profitability and has helped to reduce bank non-performing loans in the sector. Recent stress tests suggest that banks are well positioned to withstand a severe economic downturn and operational risk events. “The Bank has released two consultation papers on the review of bank capital requirements and a third paper on the measurement and aggregation of bank risk will be released shortly. The aim of the capital review is to ensure a very high level of confidence in the solvency of the banking system while minimising complexity and compliance costs. “The Bank has also completed a review of the bank directors’ attestation regime and is making good progress in implementing a new dashboard approach to quarterly bank disclosures. This is expected to go live next May,” Mr Bascand said.